Bank robberies are rare in Singapore. The last bank heist that took place was in 2008, at City Plaza, and that didn’t take long for the Police to nab the offender- and even that, it was a local Singaporean who had the guts to commit such an act. This time round, according to Channel NewsAsia, it was a Caucasian man believed to be an Australian. We know briefly that the man walked in the branch at Holland Village, approached the bank teller, giving her a slip of paper containing his demands, and walked out with $30,000 cash. Awesome la sial. When the branch was visited by reporters yesterday, the area was sprawling with cops, with over 10 Police vehicles spotted nearby. The bugger has yet to be found till now. 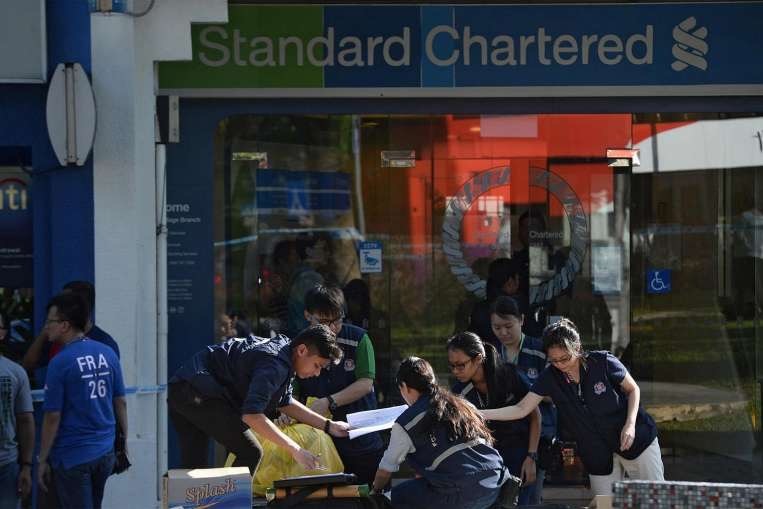 Standard Chartered claims that the safety of their staff and customers were paramount, but the question that’s bewildering us now is:- how on earth did the suspect escape with the loot without any of the staff alerting authorities while the crime was in progress? And where was the security? There wasn’t even one guard in place according to the bank when queried. Sound too fishy to be true eh. Insiders job? A conspiracy? Let’s just hope the Police get to the bottom of this asap. At the point of editing this article on the 9th of July 2016, they culprit has yet to be caught. If you ask me there has been very little progress thus far. The only leads- ones that we know of- are just CCTV footages that depicts the man in a cap, and the slip of paper that contained the demands of the bank robber. What the Singapore Police Force will do now is door to door queries, scouring all the existing customers who visited the branch often. Interview the staff to get a facial description of the person, what else. That’s about it. In my time during the Police force days, these kinda cases fell on the onus of the Neighborhood Police Centre Officers, where there was no credible lead available. #TLRB Updates as on the 14th of July. The culprit, a Canadian guy in his 30s has been caught by the Thai Police. Yep. You read that right. The bugger fled Singapore on the same day and at the current moment, Singapore is trying to make arrangements for him to be extradited back to Singapore, where we do not have an extradition treaty with the Thais. Splendid work as usual done by the Singapore Police Force!